Police turned on tens of thousands of protesters demonstrating for electoral reform in Malaysia on Saturday. It might not help the government’s image ahead of elections. Tens of thousands of yellow and green-clad protestors gathered in Kuala Lumpur were turned on by police firing water cannon and tear gas Saturday as protests seeking reforms of Malaysia’s electoral system turned ugly. The demonstrators, part of the latest Bersih (clean) rally, were driven back from Independence Square after they pushed through barricades sealing off the plaza. Almost 400 demonstrators were subsequently arrested by police, including some seen being dragged away holding bloodied faces and bruised limbs. Moments after Malaysian opposition leader Anwar Ibrahim addressed the crowd at the frontline, several protestors at the barricades suddenly shouted “back, back,” before pushing through the police lines around the Dataran Merdeka, or Independence Square, the iconic downtown location where the protestors sought to hold their sit down demonstration seeking changes to how Malaysia holds elections. Bersih is a grouping of NGOs and activists who say that Malaysia's election system is skewed in favor of the current government, a coalition that has governed Malaysia since independence from Britain in 1957. Recent electoral reforms proposed by the government don’t go far enough, say the protest leaders, who have been criticized in some quarters locally for being too close to Malaysia’s parliamentary opposition. Bersih says that anyone is free to support their electoral reform cause, including the current government. 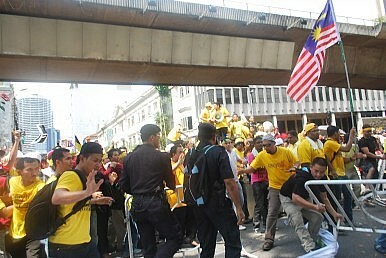 Bersih said Friday that they expected 100,000 people to take to Kuala Lumpur’s streets, and though the eventual turnout was unclear, estimates have ranged anywhere from 30,000 to 250,000 as protestors lived up to their pledge to march from several locations in the city to Independence Square, where the organizers hoped for “goodwill from the government.” The protestors said that they had the right to gather at the square, but the government ruled otherwise, saying it offered the organizers four alternative venues, a move that Bersih in turn said came too late to be logistically feasible. Bersih leader Ambiga Sreenevasan told media after the rally that a crowd of 250,000 was on the streets, concluding that “in that sense it (the rally) was a success.” But under a searing southeast Asian sun glinting off the high-rise skyline backdrop, Malaysia’s biggest city once more turned into a battleground, repeating the events of the July 9, 2011, Bersih rally, when the electoral reform group and its supporters last took to the streets. This time around, though, the blame game could go both ways, with some protestors seen pushing through barricades, followed by police firing water cannon laced with chemicals and tear gas, sending the crowd running back toward a nearby mosque and train station. In a statement released early Saturday evening, Malaysian Home Affairs Minister Hishamuddin Hussein praised police and put the blame squarely on protestors. “A group of protesters tried to provoke a violent confrontation with the police,” he said. Last July, more than 1,600 people were arrested, including opposition leaders. That crackdown prompted a decline in the government's popularity, though Prime Minister Najib Razak recently recovered some lost ground in opinion polls, partly on the back of cash handouts to households taking home less than RM3,000 a month. Last year’s loss of face also seemingly prompted a reform drive starting in September 2011, with changes proposed to Malaysia's print media regime, to draconian-sounding laws allowing detention without trial, and through new laws allowing peaceful protests.